Why Are Companies Turning to Older Workers? Should You? Not so long ago, most people worked until the age of 62 or 65 before retiring to fill their days with family, travel and recreation. After decades of demanding work schedules, employees looked forward to a life of leisure. However, while no one was looking, the rules of retirement changed! About one-third of 45- to 65-year-olds now say they plan to work part-time in their golden years – and four percent hope to have a full-time job. At the same time, employers are starting to shift their views. Some are actively working to keep their most experienced employees in the workplace or they’re recruiting older workers to fill skills gaps. What’s driving the change? When are employees from the 55+ demographic a good fit? What can you do to ensure that your workers have the skills they need to succeed? Why Hire or Retain the Most Seasoned Employees? Bouts of unemployment, lingering effects of the 2008 recession, the housing crash, huge student debt and/or providing aid to family members can explain a financial desire (or need) to work beyond a traditional retirement age. Add to that, the reputation of the current generation of older workers, Baby Boomers – born between 1946 and 1964 – as a work-driven generation that worked long hours to establish self-worth, identity and fulfillment. It’s no wonder that this generation is interested in staying employed longer or pursuing an encore career. Preserves institutional knowledge from a wave of experienced workers who are approaching retirement age. Roughly 10,000 Baby Boomers retire each day. Combats a skills shortage that, according to the Department of Labor, left employers unable to find enough talent in 2017 to fill approximately 6 million open jobs. Provides flexibility for the company and workers, matching full-time, part-time and project work with employees most suited to each opportunity. And for some companies like Starbucks, that recently opened its first café exclusively staffed by people ages 50 and older, hiring a mature workforce is a way to support a community and help boost the quality of life. When Are Older Workers a Good Fit? Start with your company needs. What work needs to get done? What skills and competencies are required to do the job? Be open about how the work gets done. Does it require a full-time person or is it better suited to two part-time workers? Does the work need to be done in the office or could someone at home provide the same support or service? Is there a permanent need or is this a transitional role? Consider the talent pool you know. Are there current employees or recent retirees that could do the job well? Are they interested? Do they need any skill development to achieve success? Stick to skills and competencies. Resist the urge (and technology) that assumes workers won’t fit because of their age alone. Eliminate recruitment questions that ask, for example, the year someone graduated from college. Instead, use competency management technology to assess candidates’ current skills. Consider this: an older employee can learn needed skills from a younger counterpart. But a younger person can’t instantly gain life or work experience. How to Ensure that Older Employees Have the Skills They Need? Many companies have a reputation of pushing older employees out during layoffs only to hire younger workers to (re)acquire the skills they need. As the labor shortage continues and the pace of change accelerates, this model doesn’t work. It’s more important than ever for employers to ensure that all workers, in all jobs, at all ages are keeping up with the changing skills requirements. Companies need a learning and development plan that supports multiple generations in the workplace, upping the skills of all workers over time. Be sure your learning plan supports older workers. A recent study found that, across all generations, learners prefer a range of tools and delivery methods. Coaching, mentoring and access to subject matter experts was most appealing to the oldest and youngest generations. They’re looking for guidance from experts who can help them continue to grow their knowledge and skill sets. Companies committed to their most seasoned employees offer ongoing on-the-job training, including onsite and web-based instructor-led training. 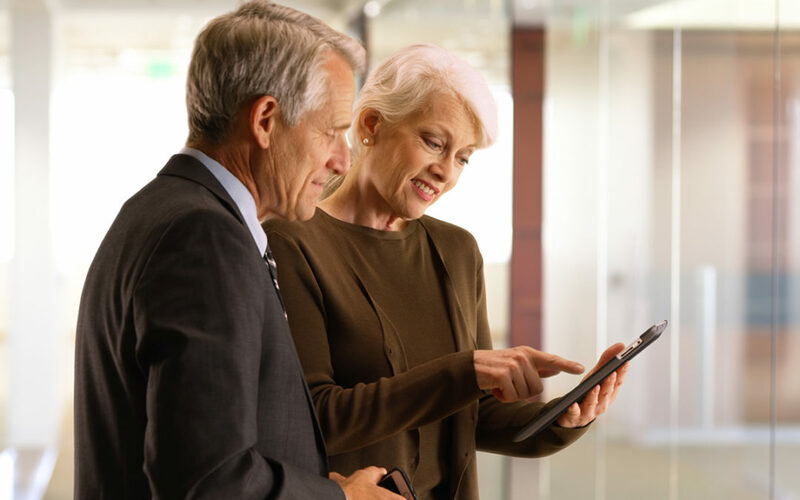 Older workers may not have a strong digital background, so check the user interface of your learning management system to make sure the screens are easy to navigate to get to the training they need. Certificates of completion and other recognition can serve to reinforce your learning culture. Our blended workforce is here to stay, with over-65 workers in the mix for the foreseeable future. Done right, this is a win-win for employees and companies alike. Are you looking for ways to attract, retain and develop older workers? Contact us to learn how a flexible competency management system or learning management system can support your goals. Or read our Energizing Performance Through Competency Management white paper to get started.